rec. Royal Scottish Academy of Music and Drama, Glasgow, Sept 2002 - Feb 2005. It was about 1983 when I first heard of Szymanowski. I’d been at a concert at the Festival Hall in London and on the way out I was given a tape of his music by a publicity agent. It was entitled ‘Karol Szymanowski, the last romantic’. Whilst there’s no denying his music is extremely romantic – more so than many who came before him, there are plenty of other contemporaries of his who outlived him who could easily be classed in the same way – Medtner for example. What is certain, however, is that Szymanowski’s music is highly individual in style and fiendishly difficult to play well enough to do it the credit it indisputably deserves. However, there is no such issue in this case as Sinae Lee is simply jaw-droppingly good with a delivery that is staggering in its ability to bring out the nuances within the music. And when you consider that this is her debut recording then I for one cannot wait for more from her. I freely admit that I am not a pianist and therefore cannot comment on the mechanics involved in bringing works like these off. I would refer readers to the excellent and far more detailed review by pianist Raymond Clarke, whose own recording of the three sonatas was justly highly praised. He has said everything about these recordings that can be said and when you listen to the music whilst reading his review you can hear what he means and this enhances the listening experience even more. 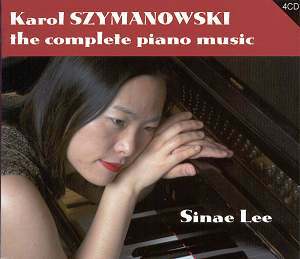 I make my comments as a lowly listener who is struck by Sinae Lee’s wonderful and seemingly effortless control, immaculate phrasing and beautiful colouration, resulting in performances I’ve never heard equalled. I have to share his disappointment with Martin Jones’s recording of the complete piano works for Nimbus which I enjoyed well enough until the present set came my way. In many ways it’s like hearing them completely afresh as if a veil has been lifted and the works take on a new meaning. As Raymond Clarke says this music has obviously been meticulously prepared in an individual way that allows each piece to show its own value whilst remaining part of a complete body of work. Lee prepared these performances as part of her Ph.D. - just imagine how the tutors felt when presented with work such as this! If there are any lovers of Szymanowski’s music who have not yet bought this set then I can assure them that there is no excuse for hesitation as they will find it a truly rewarding experience. The same goes for anyone who enjoys late romantic piano music but is yet to discover the unique sound world of this genuinely original composer.